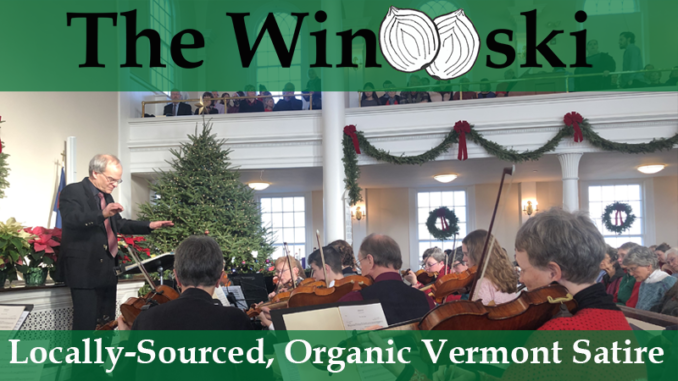 MIDDLEBURY – Police have been alerted to a potential hostage situation at the Congregational Church in Middlebury after reports came in that audience members at the annual Messiah Sing-Along were being held indefinitely against their will. The two-hour concert failed to end at 4 PM and was still going on as of press time, more than 16 hours later. Audience members began texting loved ones to inform them of the delay, and after six or seven hours the police began to receive text messages as well, asking for help. “Don’t know when I will be home, gotta go, conductor has started confiscating phones, says it is rude, oh god, he’s coming, I love you,” said one message that managed to make it out of the building around 8:45 PM Sunday evening. I find very strange that no one could leave a big place while he was conducting! Or that no one in the orchestra would get up after so many hours of absurd behavior! In a follow-up interview, the conductor of the event noted that the guest tenor soloist for the day (who reportedly provided the original inside scoop to “The Winooski”) prompted the lengthy event, insisting early in the afternoon that the rough places be made plain. Subsequently, one of the other soloists wondered who might abide the day of the humming (wait, did we hear that right?) Finally, as the crispy “k”s for “King of kings” fell into place, and tongues flipped for precision “l”s and “s”s on “Lord of lords” and as the chorus and strings articulated dotted eighth and sixteenth notes together after the sounding of the trumpet, did all exclaim a final “hallelujah” and departed rejoicing greatly. And well done all! The Lorry to God has finally departed! I was just glad to be bathed in the warmth of Stockholm Syndrome.